Like the “ship in a bottle”, the “Rubik’s cube in a glass jar” is an interesting keepsake item because it is inconceivable how a solid Rubik’s cube can be inserted through the narrow neck into the body of the jar. This was the inspiration for Jeremy Pei’s “Mystery Jar” effect. Four small cards are displayed: one has a picture of an empty glass jar, another a picture of a Rubik’s cube, another a deck of playing cards and the last card shows an 8 ball. The card with the empty glass jar is inserted on one side of a small black wallet. The Rubik’s cube card is chosen. It is placed on top of the empty glass jar card. The wallet is closed. A magical gesture is made. When the wallet is opened, the card with the Rubik’s cube becomes blank and the card with the empty glass jar is now a picture of the Rubik’s cube inside the glass jar. This card is taken out of the wallet and given a shake. The picture on the card transforms into a picture of a solved Rubik’s cube inside the glass jar! This is Jeremy Pei’s commerical routine of a novelty packet trick performed with a small card wallet. You receive all the necessary cards plus the special card wallet. This wallet is a clever utility device that can transpose the cards placed inside it, and eliminates sleight-of-hand with the cards. The cards are nicely printed on good quality card stock. You are provided with a link to a 9 minute video tutorial by Jeremy Pei. He teaches various versions of the effect with the cards, some needing standard card moves while others do not require any sleight-of-hand at all. You can also cause the 8 ball or the deck of cards to appear inside the glass jar. There is a version that does not use the wallet at all. In addition, there is also a second 12 minute video that teaches you how to put an actual Rubik’s cube inside a glass jar. If DIY is not your cup of tea, Redefine Magic Outlet also supplies a ready made-up “Rubik’s cube in a glass jar” for $20, with special discount available when purchased during our meeting. The Mystery Jar is a commercial effect ideal for walk-around or close-up performances. The people at SansMinds Creative Lab are renowed at coming up with very visual effects. This one is no exception. A spectator chooses and signs a card. It is then lost back in the deck. The performer professes to cause the selected card to rise to the top of the deck. He turns over the top card. It is not the chosen card – it is, say, the King of Clubs. The performer now blows on the card, and claims that it will change to the selected card. Nothing happens. He places the King of Clubs face up on top of the deck with one end protruding out of the deck. He asks the spectator to hold onto the protruding end of the King of Clubs. Now, when he blows on the card, it visibly changes into the spectator’s signed card. This happens in the spectator’s hand! And the spectator can keep this card as a souvenir. The change of the “wrong” card into the spectator’s signed card happens instantaneously, and is highly visual. The spectator has no clue what has happened to the King of Clubs. The top of the deck looks normal. You receive the well-produced studio-quality DVD and the necessary materials for you to construct your own gimmick. Many people will be put off by the DIY part of the product. It also requires you to be able to split a playing card. However, Herman in the DVD does an excellent job in showing you step-by-step how to do that and how to construct the gimmick. Most of SansMinds’ products require you to construct your own gimmicks. This is understandable if you have to customise the gimmick, such as using your own country’s currency bills. In this case, the gimmick is quite generic and could be supplied ready with the product. Even though the price is raised a little for the ready-made gimmick, it will attract more buyers. Some basic card handlings are required. These are taught well in the Pre-requisits Section of the DVD. Here, Herman teaches you the swing-cut, pinky break, double undercut and the double lift. There are some performing angles to watch out for when doing the effect. You also have to be careful about bright lightings as it may draw suspicion to the gimmick. You may need to manage the audience somewhat when getting the gimmick ready on the deck. Herman discusses all these and provides good solutions for them. The classic force is supposed to be the most natural force of a playing card. Yet, many people do not know how to do it well. This is because it requires timing, and spectator management. It is also a technique that you cannot practice alone – it requires a live spectator to pick a card for you. Dave Hooper has a very deceptive classic force. He calls this the “Force Of Will”. He has been doing this for over 35 years. In his hands, the classic force looks very fair and casual. The spectator really feels she has a random choice. His classic force has got high praises from card and magic greats such as Doc Eason, Harry Robson, Kieron Lefever and Chris Ramsay. 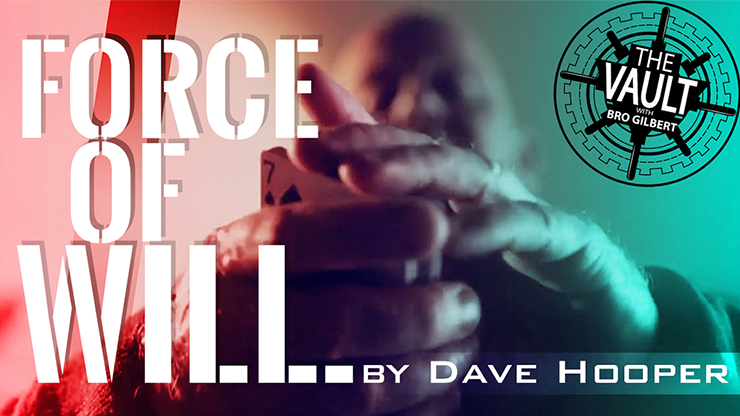 So what makes Dave’s classic force so special? This is all revealed in the 12 minutes DVD that you receive. Dave shows you how to get ready for the force, the timing, and the required follow-up actions after the force. Some outs in case the spectator misses. What to do when the spectator wants to shuffle the deck. The use of the force on magicians and on non-magicians. The use of the force on men and on ladies. The red pill, and its opposite, the blue pill, are a cultural meme. The red pill represents reality and truth, while the blue pill stands for beauty and illusion. The red pill was featured in the movies “Matrix” starring Keanu Reeves, and “Total Recall” starring Arnold Schwarzenegger. In this effect “Red Pill”, I believe its creator, Chris Ramsay, meant it to refer to the special feeling experienced by a spectator when she witnessed an impossible thing happening in her own hands! 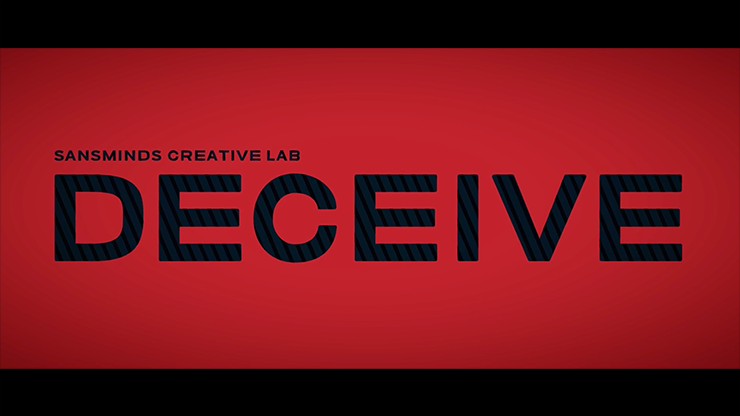 In short, Red Pill is a chosen card to impossible location effect, with a de-emphasis on the word “chosen”, and a very strong emphasis on the word “impossible”. There are 2 possible presentations. In Red Pill, a spectator is given a new and sealed deck of red back cards. The cellophane wrapper as well as the pull strip are shown to be intact. The spectator guards this deck closely by placing it between her 2 palms. A blue deck of cards is given to a second spectator. A card, say, the Queen of Hearts, is chosen from this deck. It is then lost back into the deck. The performer causes the chosen card to vanish from the blue deck and to reappear inside the sealed red deck. The blue deck is examined, and the chosen card has indeed vanished. The red deck is examined, and the Queen of Hearts mysteriously appears trapped between the cellophane wrapper and the card box. The wrapper is destroyed and the Queen of Hearts is found to be of red back. This appears not to make sense. The box seal is broken and the cards inside are taken out. There is another Queen of Hearts in the deck, but it is found to be of blue back. The chosen card has indeed transported from the blue deck into the red deck and displaces the red back Queen to outside the box. This happens while the red deck is held all the time by the spectator, and the deck was checked initially and confirmed to be completely sealed so that nothing can get out or in! The second presentation, Secret, involves only one spectator. After confirming that the deck is completely sealed, she holds it in-between her 2 palms. She names any one of the 52 cards, and this card appears trapped between the still intact cellophane wrapper and the outside of the card box. In this case, this impossbile object can be kept as a souvenir for the spectator to remind her of having witnessed an impossible effect. Or, like the first presentation, she can destroy the wrapper and open the box and finds that the named card outside is indeed missing from the deck inside in the box! You receive a special Bicycle gimmick and a well-produced DVD. You have to supply your own Bicycle deck(s) of cards. In the DVD, Chris Ramsay shows you how to use the provided gimmick to construct the necessary gaff. You will also have to prepare your own deck of cards. The 2 presentations are equally powerful in their impact to the audience. The name Red Pill is meant to refer to either one of these presentations. The strong feature of Red Pill is that the magic happens in the spectator’s hands, and under impossible circumstances (the box is shown and confirmed to be completely sealed). It is so strong that it can and should be used as a closer. Please note that everytime you perform Red Pill, the wrapper and seal are broken and you have to prepare another new deck of Bicycle cards. However, the gaff, once constructed, can be used over and over again. The first version of Red Pill requires some basic knowledge of card handling. 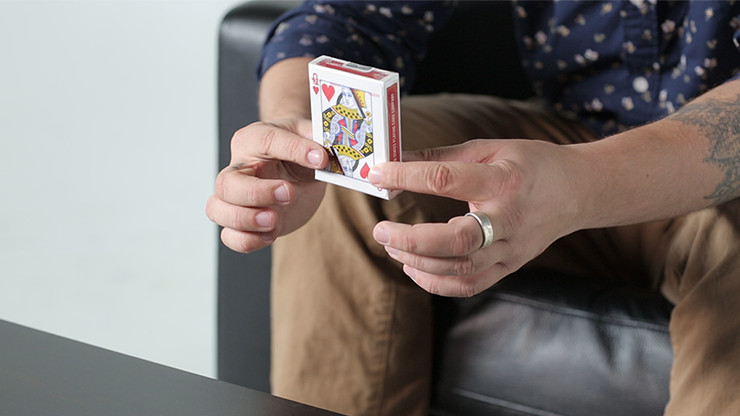 Chris teaches the riffle force, the double undercut and how to cop a card in the DVD. The second version, Secret, requires a verbal force of a card. Here Chris gives a thorough and excellent discussion on the use of Equivogue of a single playing card. Chris also teaches his “Instant Change” move, which is usually available separately as a download, and how to use this in another version of Red Pill. Chris offers other intereating ideas with Red Pill, such as a personality read of the spectator and the use of the Bicycle’s advertisement card and the performer’s business card. Mark Shortland’s AmazeBox, which it was first available, quickly became a classic utility device for mental magic. If you do not know what it is, it is a box for switching billets or folded pieces of paper. It is a paper box constructed out of cardboard, very much like the mailing box you purchase from your Post Office for mailing parcels. It has a slot on the top for audience members to drop in their folded billets. Later on, an audience member can open the box, and the original billets would have disappeared into a secret compatment. What the person sees inside the box is a new (switched) set of billets. The switch of the billets is quite indetectable. The box looks ordinary and innocent. This Box is larger than the first model, so that it can contain more billets. It is made of stronger materials so that it will not buckle and last longer. It has a magnetic locking system so that it is easier and quicker to assemble. It packs flat and smaller than previous models. It comes with a nice and sturdy envelope useful for transportation. It is made of kraft paper – perhaps, this is more natural looking than the previous completely white and completely black models. Although it is stated that the box can switch up to 200 small billets, it is more practical to use for up to 60 or 100 billets. This will ensure that the secret compartment will be able to close up nicely and not get jammed. You will have to experient yourself with your type of folded paper. You receive the AmazeBox Kraft in its flatten form inside a sturdy tranpostation envelope. You are also given a password to download a 17 minutes video instructions. 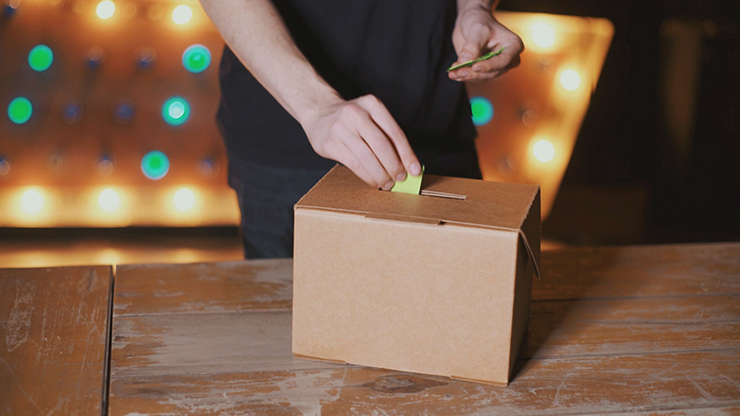 The video gives you instructions on how to properly assemble the box, and how to use it.